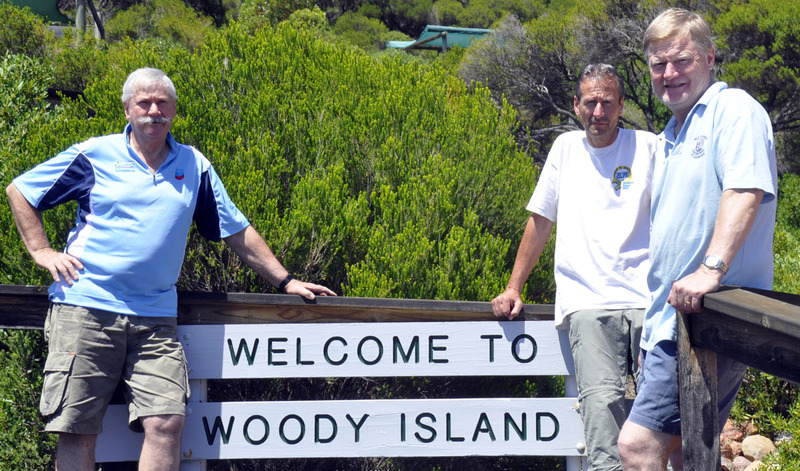 Operation from Woody Island - Story that appeared in Wireless Insitute of Australia magazine "Amateur Radio"
The West Oz DX Group have been activating the IOTA’s of Western Australia for over ten years and the decision to go to Woody Island (OC170) off the coast of Esperance was one of "well we haven’t done this one yet, it’s easy to do and a trip to Esperance would be a good run down through the wheat belt"
We announced our intentions to visit the island on our website www.westozdx.net and started planning with an initial team of Wally VK6YS, Nigel VK6NI and Jane VK6FJPD XYL of Nigel. Woody Island is probably the only south coast island in Western Australia that is easy to get to as Esperance Island Cruises (http://www.woodyisland.com.au/) run a regular ferry equipped for up to 90 persons to the island in the summer holidays and at other times by arrangement. 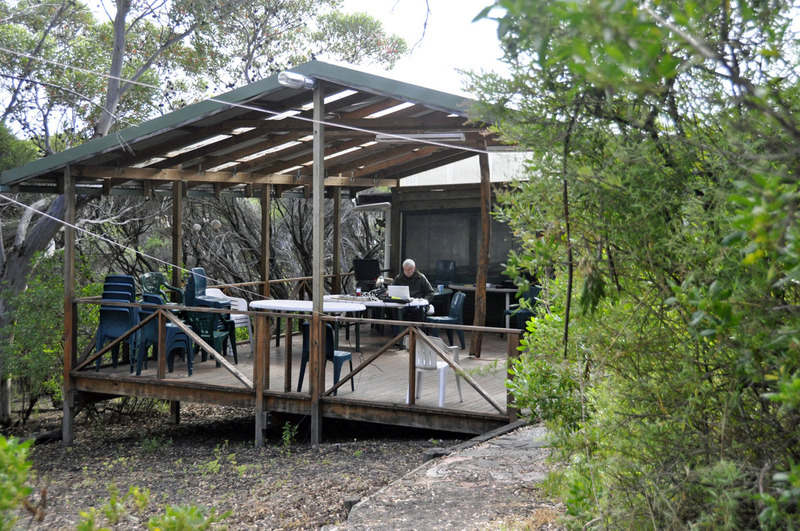 The island is well set up with a visitor’s centre, safari style accommodation and camper’s kitchen. Shortly after we started planning Reinhard DF4TD contacted us, he was planning a trip through WA and enquired if he and his partner Rita could join us on the island? The answer was of course a yes as another operator takes some of the load off everyone. Planning for this type of trip takes some effort if you want things to go well and initial contact was made with Esperance Island Cruises well in advance. After some initial "you want to do what?" questions all was cleared for us to go and set up aerials, etc on the island. We elected to go slightly out of season at the start of November as this would mean we would have few other people with us on the island. As it turn out there was no one else there even the caretaker was off site and we were left to look after ourselves. There was some question over power supplies as it was not clear what was available in the way of 240 volts and the website said "limited 12 volt solar supplies for lighting only". As it turned out the island had recently been taken over by new owners who were working hard to restore the infrastructure that had been allowed to run down over the years and limited meant very limited! The 240 volt supply was intended for camp utilities and fridges but only to be run in daylight hours. So as with all other IOTAs we have activated we elected to take our own power supplies in the form of two one kilowatt inverter style generators. One of them was a trusty Honda that had been used before and is clean on HF, the other was a "Bushpower" brand that had been sourced over the internet for a price considerably less than the Honda but when fired up turned out to produce terrible interference across the HF spectrum. Initial thoughts were that it would be unusable but after a bit of head scratching and looking at various options a CORCOM 10R6 filter was fitted and the problem was completely cured. These filters present a brick wall on the mains line above 1Mhz and we would recommend them to anyone with a similar problem, ours was sourced direct from the US however a quick check at the time of writing shows they are readily available on eBay. Both generators ran flawlessly for the four days we were on the island. The two operating stations consisted of Icom IC7000 radios interfaced to laptops to help with logging. One of the radios was also set up to allow keyboard CW sending. Aerials were a Spiderbeam for 20, 15 and 10m for one station and the second station had a Force12 Sigma 40XK vertical dipole with switching to simple resonant vertical antennas for convenience on some of the higher HF bands. Power supplies were 20amp switched mode units that had been used before and were known to be RF quiet. We also took a 100 amp hour battery and 80 watt solar panel for back up and listening during quiet times but in the end we did not need to use them. ICE band pass filters were used on both transmitters to stop interference between the two stations. On arrival in Esperance we went met up with Reinhard and Rita and went to Esperance Island Cruises office to make ourselves known. It turned out there was a bit of a problem, they could not take us off the island on the organised day but would we be OK to stay on for another day? When faced with another 24 hours of DX what would any full blooded amateur do but make the sacrifice and stay on? We had decided to take the optional island and wildlife site seeing cruise on the way out to the island and this turned out to be well worth while with a great views of the local wildlife and scenery. Set up on the island turned out to be easy after we got ourselves orientated. Since there were no other people on the island the campers kitchen became the operations centre with both transceivers set up in the shade and within calling distance of tea or coffee. Aerial erection was easy for the verticals but the Spiderbeam proved troublesome as there was limited cleared space and lots of shrubbery to snag every wire, it seemed, as we put it up. Eventually everything was in place and we were up and running using the callsign specially issued for the event, VK6WDI . The DX came in well when the bands opened. We started late on Friday afternoon working 17m SSB into Japan, Russia and Eastern Europe and this carried on into the night with activity shifting to 20m SSB and 30m CW with contacts all over Europe and even some to the East Coast of the United States. We worked late into the night until the bands finally gave out and then had about five hours sleep before it all started again. The next two days were much the same with action starting early in the morning with plenty of JA stations, a scattering of VK’s and contacts into the West Coast of the US on 15 and 20m SSB. As the afternoon wore on 17m CW activity started and 20m SSB opened up into Europe. There was always a lot of QSB on the signals and it was obvious that some Europeans were having a lot of trouble hearing us above local QRM. Locally the noise level was very low and that meant we often heard stations but they could not hear us. For us to have gone with greater transmit power and better antenna would have complicated both transport and increased cost considerably hence this type of expedition is always a bit of a compromise. We are firm believers that as the one being chased we should apply the KISS principle to activate these islands and it is up to those chasing to accept the challenge to work us. It is evident that many did from the range of calls, 52 countries worked on 20m SSB and 36 on 30m CW for an overall 1294 contacts in two and half days. Despite OC170 not being on the most wanted list of IOTA’s the QSL cards are now pouring in. 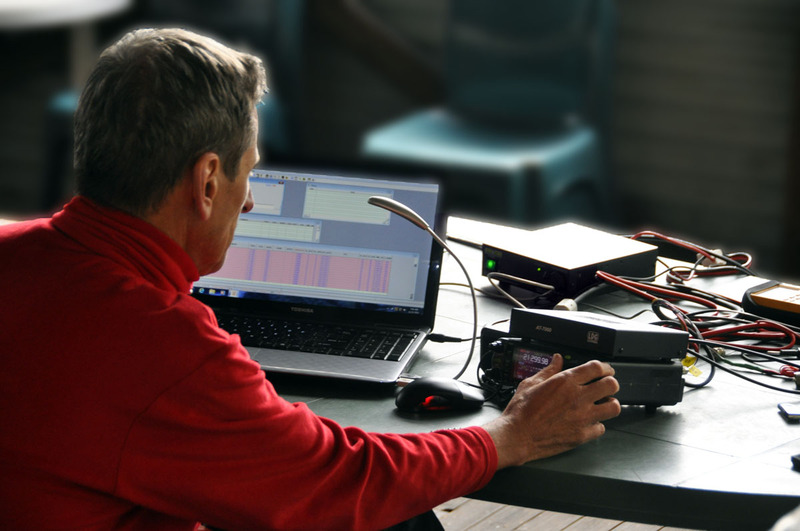 There was also a pleasant Sunday morning catch up on 40m after the WIA news broadcast from VK6WF in Kellerberrin with 12 VK6’s taking the time to work us. Two days into the operation we got word that our anticipated extra time on the island had been curtailed and we would be picked up as originally planned. Much to our surprise the ferry instead of having a scattering of people on it as had happened on the way out was full with upwards of 80 people on it. It turned out a cruise ship with 3500 passengers had docked in Esperance and overnight the population of the town had boomed! Somehow we managed to get our equipment on board and get back to the mainland. This all goes to show that a little bit of flexibility is a good thing when it comes to planning these expeditions as you never know what might come up. All contacts for the weekend were uploaded to Clublog (http://www.clublog.org) as we were within range (just) of Esperance mobile phone coverage. Station 1 was the Force12 Sigma 40XK centre fed vertical dipole configured from 40 through 10 with vertical ground plane antenna for back-up. Station 2 had a Spiderbeam with 20/15/10 bands active.